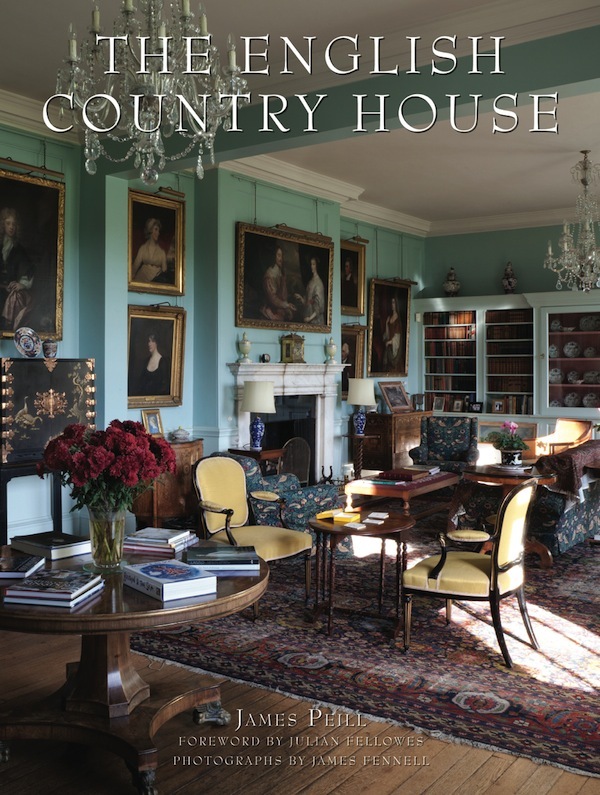 Like last year’s The Scottish Country House, the book includes beautiful natural-light photography by James Fennell and through James Peill’s approachable and informative text, we are escorted through the houses, replete with architectural explanations and savory social tidbits. Milton in Cambridgeshire, for example, became the foundation for Daphne du Maurier’s Manderley in Rebecca, based on her memories of childhood visits in 1917 when it was being used as a convalescent home for British Army officers. A more tragic memory notes it was the heir to Milton who, with his lover, JFK’s sister Kick, was killed in a 1948 plane crash. 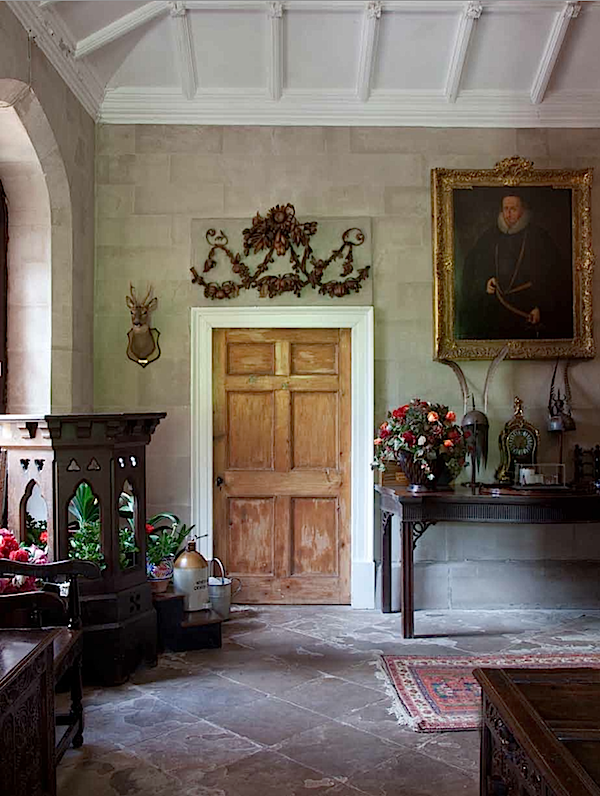 The house is now meticulously maintained by the tenth earl’s grandson, Sir Philip Naylor-Leyland, Bt. 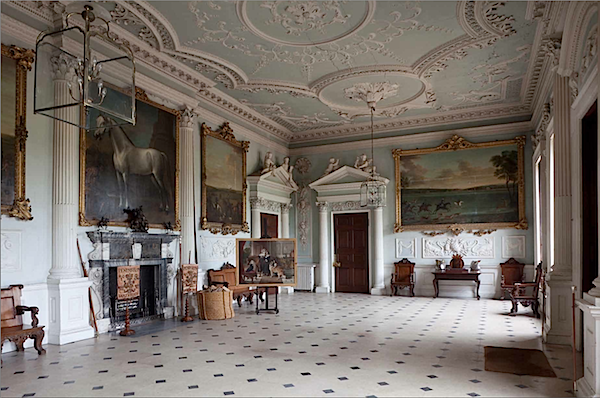 The first floor gallery, above, with its spectacular three part ceiling, was designed in the early 1700s. 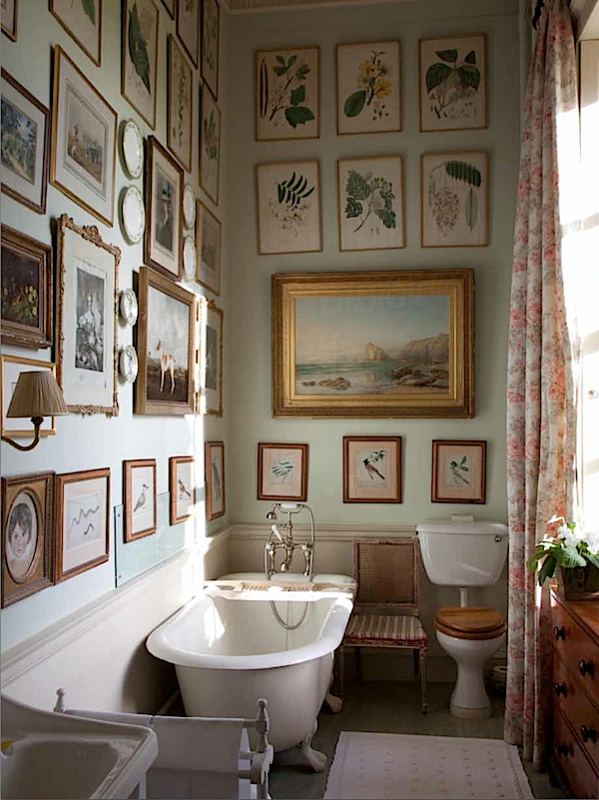 A bath below charms with its eclectic gallery wall. The book ranges from smaller houses (a relative term), such as Kentchurch, below, home to the Scudamore family for nearly a millennium. to the more well known grand estates such as Badminton. The current house, originally dating to the 17th century, has seen a complex series of additions and remodeling through the years. 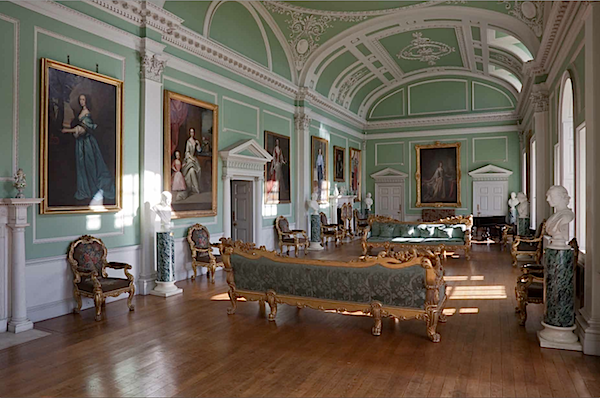 It was under the third Duke of Beaufort, during the 18th century, that many famous enhancements were made, including the decoration of the Great Hall, below. It was here that the groundwork for the game of badminton was laid. In fact, the standard size of a badminton court today is the same as the Great Hall. 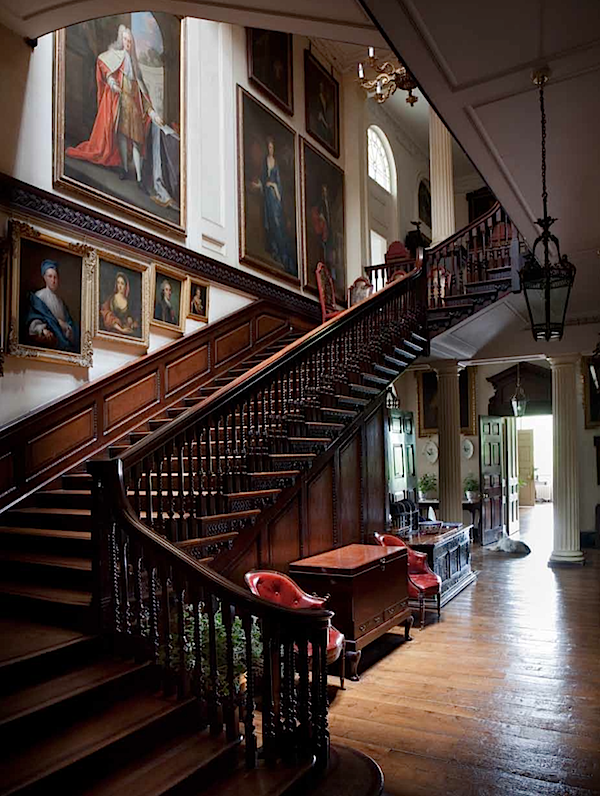 The Great Staircase, remodeled in the early 19th century, features some of the almost 200 family portraits hanging in the house. Following the destruction of almost a thousand British country houses between 1945-55, many families have had to think of innovative and creative solutions to keep their ancestral homes alive. At Badminton, the annual Horse Trials have proved indispensable to the survival of the estate. And at Goodwood, below, the famous Festival of Speed and a myriad of other events have been a boon to the financial fitness of the property. 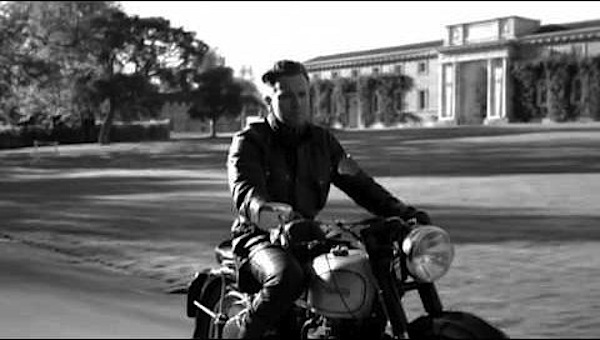 You may remember the exterior from the brilliant ad campaign introducing Belstaff a couple of years ago – a fabulous fusion of old and new. 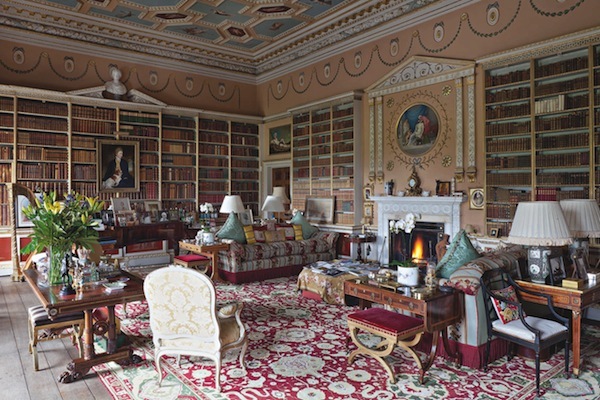 The book celebrates the enduring legacy of the English country house and the families who for centuries have been guardians of their fate. For the aficionado of architecture, interiors, history or way of life, this is a keeper for your collection. This entry posted in architecture, books, design, furniture, interior design. 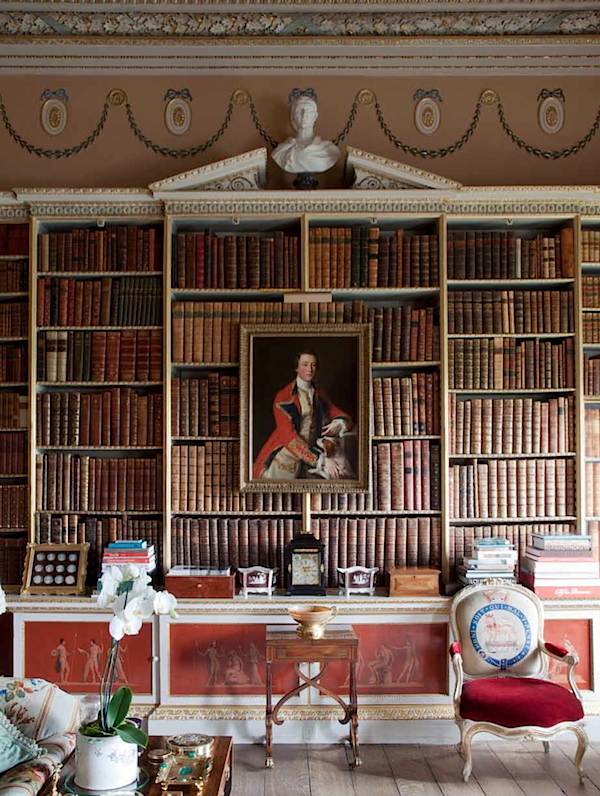 Entry Tags: Design Books, English Country House, interior design Bookmark the permalink. The architecture and ancestral portraits are grand! This is definitely a must-have book! It always makes me so sad to think of the country houses that were destroyed after the war. The determination of the families who kept their homes going is inspiring, and these are beautiful examples. Counting the days until Downton returns! 78 queries in 0.453 seconds.